As I entered the store with wall-to-wall people, I was prepared to scan the merchandise and get out before claustrophobia overtook me. It was a very unique store with a very intriguing name. Philanthropy Fashions greeted me with earthy décor and colors including wadded paper bags used in the most adorable advertising. Antique shoes held shelves of books. Old suitcases cuddled comfy sweaters and tree branches adorned hanging scarves. It was just adorable and relaxing all at the same time! Then I heard it….Christian music. Then I felt it….the peace throughout the store. Then I understood it….PHILANTHROPY FASHIONS. The store was a faith-based organization that gives 10% of its proceeds to non-profit organizations domestically and internationally. Right there in the middle of the most crowded store on the strip was the wall that warmed my heart and opened the floodgate of tears all at the same time. The prayer wall. Yes, a wall full of hanging tags of prayer requests. The guests were encouraged to leave a prayer request on a tag and to take a request from the wall and commit to pray. The prayer wall. To me, it was a unity wall. The symbol that brings us all together – hurt and hope and healing. All right there for us to unite under one God – the one and ONLY God. The wall that says we are still one nation – actually one big ole world – under God. The wall that reminds me to stand firm on my foundation and kneel only in prayer to the One who can heal our nation. The Unity Wall. The Prayer Wall. The Wall that can knock down all other walls. In Jesus Name. 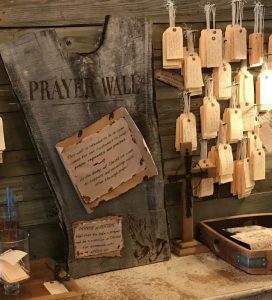 This entry was posted on October 17, 2017 with tags: #kindnessmatters, #makeadifferenceeveryday, #philanthropyfashion, #prayermatters, #prayerwall, #unity by Deanna Young.